the mean man understands profit." Which is better [ ], to live among good [ ] or wicked [ ] fellow citizens [ ]?... Do not the wicked do some harm [ ] to those who are ever closest to them, whereas good people [ ] do some good [ ]? for men, private [ ] and public [ ]. If a man thinks only of his own profit, and tries to benefit himself at the expense of others, he will incur the hatred of Heaven. comme les fleuves se perdent dans la mer. as rivers lose themselves in the sea. kann nichts ganz Gerades gezimmert werden. nothing entirely straight can be built. Immanuel Kant, "Idee zu einer allgemeinen Geschichte in weltbürgerlicher Absicht," "Idea for a Universal History with a Cosmopolitan Intent" [1784, Was ist Aufklärung, Felix Meiner Verlag, 1999, p.10; Perpetual Peace and other essays on Politics, History, and Morals, translated by Ted Humphrey, Hackett Publishing, 1983, p.34; translation based on Isaiah Berlin, The Crooked Timber of Humanity, Princeton, 1990, p.v]. Bei allem Werthe, der dem Wahren, dem Wahrhaftigen, dem Selbstlosen zukommen mag: es wäre möglich, daß dem Scheine, dem Willen zu Täuschung, dem Eigennutz und der Begierde ein für alles Leben höherer und grundsätzlicherer Werth zugeschrieben werden müßte. Admitting all the value accorded to the true, the truthful, the selfless, it is nonetheless possible that a higher value should be ascribed to illusion, to the will to deception, to self-interest, to greed -- a higher and more fundamental value for all life. Friedrich Nietzsche, Beyond Good and Evil, translated by Marianne Cowan [Henry Regnery Company, 1955, pp.2-3, translation modified]; Jenseits von Gut und Böse [Philipp Reclam, Stuttgart, 1988, p.8; daß restored for dass, müßte for müsste]. But what is government itself but the greatest of all reflections on human nature? If men were angels, no government would be necessary. If angels were to govern men, neither external nor internal controls on government would be necessary. In framing a government which is to be administered by men over men, the great difficulty lies in this: You must first enable the government to control the governed; and in the next place, oblige it to control itself. A dependence on the people is no doubt the primary control on the government; but experience has taught mankind the necessity of auxiliary precautions. Attributed to John Maynard Keynes, provenance unknown. Hamilton was, indeed, a singular character. Of acute understanding, disinterested, honest, and honorable in all private transactions, amiable in society, and duly valuing virtue in private life, yet so bewitched and perverted by the British example, as to be under thorough conviction that corruption was essential to the government of a nation. Fans of Bernard Mandeville should understand his argument, which is that dishonesty, fraud, and imprudence in both business and government, and even in law and religion, are good things. If this is not understood, that is one thing; but it cannot be seriously maintained by any sensible person, and confused defenses of it only serve to discredit free market principles and even the rule of law. In 1705 Bernard Mandeville, a Dutch physician relocated to London, published a poem, The Grumbling Hive: or, Knaves Turn'd Honest. This was an allegory of morals and economics using the experience of a beehive, which went from prosperity and power to poverty and weakness because of ill-considered "reforms." The poem attracted no attention. It was reissued in 1714 as The Fable of the Bees: or, Private Vices, Publick Benefits, with a series of "Remarks" or comments on the poem, and an added essay, "An Enquiry into the Origin of Moral Virtue." New editions in 1723 and 1724 added more to the "Remarks" and supplied further separate essays. It was only in 1723 that what was now a substantial book attracted public notice, nearly all negative. Mandeville was denounced, not just by the press and the clergy, but by figures as diverse as Edward Gibbon, Francis Hutcheson, and George Berkeley. He was condemned as advocating the same level of immorality as Niccolò Machiavelli and Thomas Hobbes, who were both widely detested. 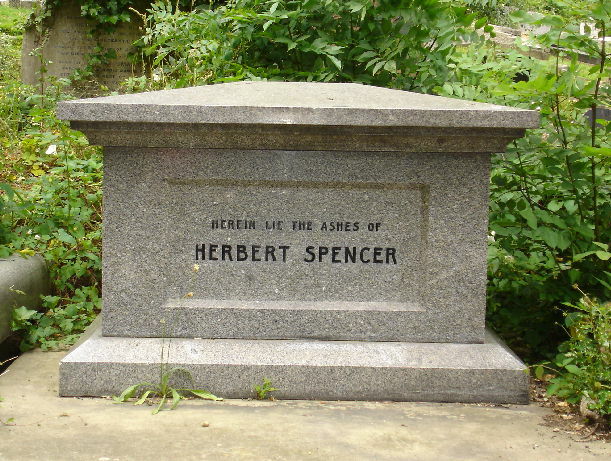 which is usually attributed, perhaps not justly, to Herbert Spencer (1820-1903), but is certainly suited to Friedrich Nietzsche -- who, however, really had no interest in economics, although he did think that the weak should die, or be exploited, for the benefit of the strong. But the idea that Mandeville, Smith, and Social Darwinism all belong in one presentation, and seamlessly fit together to form the standard theory and defense of capitalism, is a grotesque distortion. Goodman is not targeting Mandeville, Smith, or Spencer individually, but capitalism in general. At the same time, Hayek's defense of Mandeville seems to me to ignore the real objections against him and to attribute to him a level of understanding that I am not sure he possessed -- even Hayek doesn't seem quite sure. But the very existence of Hayek's defense, let alone Rand's reversal of traditional forms of vice (selfish) and virtue (selfless), may contribute to the sort of confusion and misconception that we see in Goodman. And we doubtless are expected to take seriously whatever "Marxists warn" us about [note]. So Mandeville's errors gravely undermine the cause of freedom, which is never helped by Marxist warnings or misrepresentations of the moral terms of capitalism. Criticism of the thesis of "Private Vices, Publick Benefits" is fully warranted, but Mandeville's principles are irrelevant or adverse to the proper theory and defense of free market and free enterprise capitalism, which Smith correctly called "the natural system of liberty." And the history of Marxists in suppressing freedom, murdering opposition, and generating mass poverty is something that cannot be overlooked, however tempting it is to credit them, confusedly, with some kind of insight. There is no motive for human action other than self-interest. In these terms, there are no disinterested motives and no genuine self-denial in human action. Something of the sort may be suggested by the Christian belief in the Fallen character of human nature. Thus, we find Immanuel Kant and James Madison in the epigraphs above both asserting that humanity cannot attain to angelic perfection. However, they would not deny that some people can act in a disinterested and unselfish manner. It is just that we cannot rely on always dealing with such people in ordinary life or public affairs, and precautions must be taken, both personal and political. But Mandeville seems to think that human nature precludes the existence of people with disinterested motives. But since we must guard ourselves against the wicked in private and public life, it is possible that Mandeville's thesis might not make that much difference. However, it does. As we shall see. We find no such terminology or discussion in Mandeville. Instead, self-interest is consistently represented by lists of vices. Sometimes people think these vices will be mitigated by an "enlightened" self-interest, which apparently is supposed to mean some sort of intellectually elevated substitute for actual morality, appropriate for people who perhaps don't believe in the intellectual or philosophical respectablity of what the masses or dogmatists (in their naiveté or masochism) think of as morality. However, there is no intellectually elevated substitute for morality, whose absence always leaves the agent figuring what, as a matter of prudence, he can get away with. Instead, self-interest is either bound by the conditions of morality, or it isn't; and if it isn't, we expect wrongful actions from the agent. Thus, is not "enlightened" self-interest. It is simply sober self-interest, where sobriety includes consciousness of moral obligation. Vices are notably of two kinds. As background, the appropriate general principle in ethics should be that vice causes harm -- just as virtue (virtus) embodies or effects something good. We get the semantic field of "vice" from Latin vitio, vitare, "to injure, damage, corrupt, spoil, mar"; vitium, "vice, fault, defect, blemish, imperfection"; vitiosus, "vicious, faulty, defective, corrupt, bad." And so we distinguish between harm (Latin damnum) to oneself ( ), personal or private vices, and harm to others ( ), which we ought to call moral vices (injuriae, "injuries, injustices"). Here we have a marvelous list of vices -- Avarice, Prodigality, Luxury, Pride, Envy, Vanity, and Fickleness in "Diet, Furniture, and Dress" -- with a sample of Mandeville's argument: That all these evils are productive of good, because they create industry and trade, employing millions for manufacture, transport, distribution, and sales. The thrust of the whole poem is that when the vices are eliminated, what goes with them is all the industry, trade, and employment, leaving stupid poverty and an idleness that motivates people to leave -- the way, perhaps, they now leave New York, Connecticut, New Jersey, and Illinois. Thus, the subtitle of the original poem, "Knaves Turn'd Honest," refers to the experiment that in the Hive eliminated vice and at the same time abolished all prosperity and flourishing. The Knaves turning Honest was not beneficial. So we see a bit of sophistry here in Mandeville. Is it only vice that requires diet, furniture, and dress? Certainly not. And Hume goes further. No "indulging of any delicacy in meat, drink, or apparel" will be a vice, unless it does what vice does, namely harm. The very idea that self-interest is always vice, or that "gratifying of any sense" is always an example of this, may rely on the religious anhedonia with which Mandeville was certainly familiar from the Calvinist Puritanism of his native Netherlands, which Britain had so recently experienced, not only in the grim Scottish Kirk, but in the Commonwealth government of Oliver Cromwell. Such religious inspiration is what Hume himself refers to as "frenzies of enthusiasm," which was the terminology of the age for fanatical religion. Thank God for the Restoration, and for Charles II reopening the Theater, putting women on the stage, and bedding them. In the kind of political moralism that exists today, it is an easy sophistry to agree with Mandeville and dismiss all self-interest, i.e. the prudent rights and occupation of most with their own livelihood, property, and harmless diversion and entertainment, as vicious. The Khmer Rouge killed people for acts of affection or pleasure, which distracted from their wholehearted devotion to work and revolution, and consequently were counter-revolutionary crimes. Mandeville, therefore, far from a sound defense of the free market, can be flipped over into the opposite, with the implication that self-interested human nature must be crushed and destroyed, in order that the socialist "new man," with no self-regard whatsoever, can be created by overwhelming totalitarian force. Indeed, such a goal of such a project could not possibly be accomplished by anything less; and its agent would not recoil even from the necessity of replacing human beings with robots to effect its fulfillment -- satisfying himself, as Mandeville himself says, with "a certain Pleasure he procures to himself by Contemplating on his own Worth" [p.92], which contributes to his own self-interested Pride. Mandeville, at least, would derive some satisfaction from the evident improverishment of Cambodia, Cuba, Venezuela, and Detroit. But the problem in these places was not the replacement of vice by honesty, as in the Fable, but by the political dishonesty and folly of murderous and thieving political leaders. The evils of personal vice, as Kenneth Minogue observes above, do not really need the intervention of government. If Romans 6:23 is correct, and the meaning of vice is harm, then personal vice is self-correcting; and we can recognize the problem when government decides to substitute its sanctions for the natural ones, in, say, the "war on drugs," whose justification seems to be that even if a user is not actually harmed by his habit, we will be sure to ruin his life through arrest, prosecution, punishment, and a criminal record, or murder in prison, just to make sure that he takes seriously....what? Drugs? Or, actually, Government? The reasoning there seems to be that drug use is more sin that vice, and that it warrants punishment, not because of any earthly consequences, but because it offends God -- who nevertheless seems to have forgotten to condemn alcohol, smoking, or drugs anywhere in Scripture. But when God really has nothing to do with it, the issue is the Wrath of Government, and its expectation of blind obedience, in contradiction to the principles of a Republican polity, not the Wrath of Heaven. Mandeville's "Private Vices" are thus one thing, and far from seeing in them "Publick Benefits," we are bound to recognize the plain moral meaning of the terms, which is the harm to those who practice them, or certainly practice them in excess. For that is another dimension of the question ignored by Mandeville. An appeal of the Hume quote above is to moderation, and so again to a doctrine existing since Aristotle, that virtue consists of a mean, a "measure," a -- which itself goes back to the Delphic Precept, , mêdèn ágan, "nothing too much," or "Nothing in Excess." We might gather from Mandeville that excess is good, even as Gordon Gekko said that "greed is good," meaning the traditional vice of avarice, whose definitions, as we have seen, tend to rely on "excess" or "excessive" to distinguish it from honest labors at economic improvement and advancement. 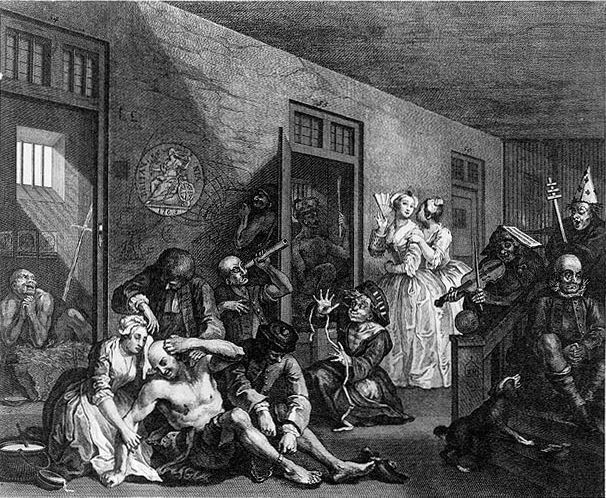 But if excess is recommended, then Mandeville's expectations of prosperity will be disappointed, since vice will limit itself, sometimes even through the death of the practioner (as in drug overdoses), or insanity, such as we see in Hogarth's moralizing Rake's Progress, where young Tom, having squandered his fortune, and that of his wife, on prostitutes and gambling, is sent to Debtor's Prison and is finally committed to Bedlam. The punishment for imprudence, improvidence, and indulgence is here quite severe indeed. Of their good-natur'd heedless Neighbour. The extraordinary thesis here is that, while Greed may be good, Crime is even better -- and not only that crime is a good, but that even the "grave Industrious" are criminals also, so that there is really no difference between honest and criminal labor. And we get a special bit of sophistry, for it is true that "no Calling" is "without Deceit," on the part of some practioners, who are dishonest; but this does not imply the identity of honest trades and occupations, and all of their practioners, with those that are essentially parasitic, harmful, and wrongful. Adam Smith famously said that we do not expect to derive our bread from the benevolence of the baker, which is true. The baker does not act out of benevolence, but out of a desire to make a living -- hopefully with the added feature, in part for his own sake, that he likes bread and is proud of his product. But we do expect something from the benevolence of the baker; and that is honesty, that, for instance, he is not adulterating his flour with chalk, or using dishonest weights, or failing to clean his facilities. The thumb of the dishonest butcher on the scales is infamous. But it is not hard to imagine Mandeville arguing that the dishonest baker or butcher is better than the honest one, and that there is really no difference between them anyway. He certainly fails to make any of the relevant distinctions. So Mandeville is not just an apologist for business or capital. He recommends that all "State's Craft" vigorously employ fraud and corruption. Bribing a Judge, "with Gold," makes him more prosperous, and you too, in avoiding an adverse judgment, while frivolous lawsuits by Lawyers certainly mean prosperity for them and the whole court system. Market inspectors, who check the weights used by merchants, can be bribed also, which helps the merchants. Thus, anyone referring to the "nastiest motives of the nastiest men" may not realize that their Noble and Selfless Public Servants, of Politicians and Bureaucrats, whose power is recommended by all Leftist politics (apart from the genuine Anarchists, of whom there are few), are also themselves supposed to be the "nastiest men" in the philosophy of Bernard Mandeville. His is a generous apologia for all corruption, crime, and dishonesty, whether in a proper capitalist business or not. And since Statecraft dominates all, we must be particularly sure that those in genuine political and judicial authority are themselves sufficiently Corrupt to insure our power and prosperity. That there may be diseconomies to all this escapes Mandeville's consideration. Of course, we have seen many examples of such regimes; and they are not prosperous for the vast majority of their citizens. There is a special name for them: "Kleptocracy" ( ), "Govenment by Theft." And we know why that will be. Theft is a negative sum game, which means that the total value involved after the "transaction," i.e. the theft, is less than before. Mandeville himself refers to the fruit of the "Labour Of their good-natur'd heedless Neighbour," but we recognize now that this will always be worth more to the "heedless Neighbour" than to the thief that steals or swindles it, and this will be reflected in the reduced prices that "fences" will pay for stolen goods. As it happens, taxation is also a negative sum game, since the politicians who spend it also have acquired it by no effort of their own, and often budget worthless outlays for political reasons -- these days, holding government to its appropriate responsibilities often seems a hopeless business. Similarly, rent-seekers expect a monopoly return for privileges they have obtained for political favors. It is the essence of corruption, just such as recommended by Mandeville (and, according to Jefferson, Alexander Hamilton, the darling of recent Broadway), yet the ultimate waste and loss that is involved, including the useful purposes missed by the misallocation of capital, preclude the prosperity that Mandeville claims for his recommendations. "Bridges to Nowhere" and political vanity projects litter the entire world, often to the exclusion of any needed or worthy constructions. In New York City, four billion dollars was spent on a spectacular, but unncessary, transit concourse, the "Oculus" -- which looks like Godzilla's skeleton -- while in 2017 "deferred maintenance" allowed wooden ties to literally crumble on commuter lines, causing detrailments and delays. This is the poster child for "misallocation of capital." So what Mandeville provides is not really a defense of the free market or capitalism, but of corruption and crime. And even if "Marxists warn" that capitalism itself is crime, they can take cold comfort from Mandeville, who recommends crime for all government. Thus anyone, like F.A. Hayek, who thinks that Mandeville makes a valuable contribution to the history of economics, had better take care to observe what the man actually says. But is not clear what this is supposed to mean, when there has been no hint of it earlier, and when there was no limitation described on the benefits of pure Vice. As I said above, perhaps the provisons we must make for the wickedness of others, private and public, mean that Mandleville's view of human nature is not effectively different from that of Kant or Madison. However, Mandleville has already undermined the force of his own reference here to "Justice," since we know from his own account that his Judges are corrupt, and will suspend the enforcement of Justice for a consideration in Gold. Mandeville cannot have it both ways. And it is not just that judges can be made honest by the provision of inspectors and guardians to observe and sanction their behavior, such as Madison would recommend. No, we cannot forget Mandeville's argument that the vice itself is beneficial. We do not want judges sanctioned for bribery, for the bribe is itself the benefit. There may even be an argument in that. We could say that as bribes are separate economic transactions, they add to the sum of transactions in the economy. This must be good. If each transaction is good. This, however, violates a basic principle we learn in economics later, namely, the "Broken Window Fallacy." If a transaction results in a negative sum, this not only constitutes a decline in value, but it likely precludes another transaction that may result in a postive sum and an increase in value. This dimension would never have suggested itself to Mandeville, even as it often escapes modern economists, like Paul Krugman [note]. However, Mandeville does not say in his poem that some vices are good and other bad. It is pretty clear that they are all good. And the problem is going to be, not that we fail to distinguish the good from the bad, but that all vices, in principle and by definition, are in fact bad. Corrupt lawyers, ministers, and judges, whose dishonesty is so warmly recommended, do not seem to provide much promise of pursuing a "good vice/bad vice" policy. At the same time, vices that are vicious because of harm to others, do not threaten to "grow into crimes," they are crimes already, and the harm they effect is, again, intrinsic. And how will they be "severely punished" when we can just bribe the judges? And, as Harth notes himself, the key virtue that is at first absent from the Hive, and then instituted in its disastrous reform, honesty, is itself essential to all righteous action and, by its absence, essential to the initial prosperity of the Hive. Thus, we are not faced with distinguishing good vices from bad vices, when the poem itself reduces the whole business to one vice, dishonesty, all of whose benefits are destroyed when replaced by its opposite. So I think Harth, to the extent that he buys into the program just described in the quoted paragraph, is confused; and Mandeville, if he actually contemplates something of that sort, which I doubt, is simply incoherent. So, with a description such as we find in Lenn Goodman's criticism, the reference to "Mandevillian economics" means that we are off to a totally misconceived start, from which nothing cogent or valuable is liable to be inferred. And Goodman's idea that the "myth of the invisible hand" is to promote the principle that "private vice is public virtue," has nothing to do with what Mandeville says or with Adam Smith's later conception of the "invisible hand." So the connection that Goodman draws is entirely spurious and fictitious. There is no vice in honestly buying and selling, but a seller always wants to get more, and a buyer always wants to spend less. That is why in a market there is an "ask" and a "bid." These are, as such, innocent desires. With back-and-forth offer and counter-offer, the result typically is not what either party wanted initially. In traditional Middle Eastern markets, without fixed prices, every single shopper experiences this dynamic. The "invisible hand" is therefore the fact that the result is almost never what any of the parties originally intended -- and each may actually think that the other is trying to cheat him. One result of this is that the day to day behavior of the Stock Market can neither be predicted, nor explained, by anyone. The continual surprise and rationalizations of market "experts" are evident in their faces and demeanor. And a certain kind of person may think that a conspiracy is at work, since they cannot believe anything can happen without design. Thus, former news commentator Bill O'Reilly never said anything when gasoline prices went down; but when they went up, he knew it was by the malevolent intent of someone. He would challenge financiers and economists to tell him "Who sets the price?" Mostly they didn't know how to answer -- which is curious. But when prices would go back down, he never asked anyone about it. And, of course, in a commodity market, the price is set by the last person to accept an "ask" or a "bid," thereby buying or selling a quantity of that commodity -- which will set the price for the day, if it is the last transaction in the session. So, if there is no "invisible hand," Lenn Goodman must believe that all prices are set by conspiracy, something we seem to find most Leftist politicians believing, who then want to fix their own prices. That such "unintended" phenomena exist is acknowledged by no less than Karl Marx. No capitalist intends to destroy capitalism; yet, in Marxist terms, overproduction, while impoverishing the workers, will create crises that bring down capitalism. But the capitalist kann nicht anders. On the other hand, Marx could never acknowledge that both employment and production are contingent on prices in their respective markets. And while some notorious capitalists have famously attempted to corner the market and control prices, not only have they failed historically, but effective price fixing can only be accomplished with the corrupt connivance of government (as Mandeville will cheer, "Hurray!"). There we find, not the invisible hand of the market, but the quite visible heavy hand of politicians -- although efforts at concealment and deception are common. Market clearing prices can only be found in a free market. Prices that do not clear the market, but which are always the clumsy result of price fixing, mean that there will be surpluses or shortages, i.e. waste or want. This is the result of disparaging and the rejecting the "invisible hand." Perhaps waste and want are what Goodman wants, but whatever he wants, it has nothing to do with Bernard Mandeville's "Private Vices, Publick Benefits," or with Adam Smith. We also should address Goodman's accusation of Social Darwinism. Capitalism is often disparaged as a system where there are "winners and losers." This seems to be what Goodman has in mind when he says that the "invisible hand" regards the "old, the halt, the very young, and the handicapped dispensable,"
so that "the invisible hand will starve those whom pity fails to sustain..." But this is grotesquely misconceived. "Winners and losers" in capitalism are among producers, i.e. businesses, not among consumers. Although few shed public tears for failed businesses (Hillary Clinton famously said, "We are not responsible for every undercapitalized business"), political forces often move to protect them. If that grows into a system, where producers have a right to legal protection (like the taxi monopolies in many cities, or farm subsidies and import quotas), this is what is called "Mercantilism" (or now, "Crony Capitalism"), the very regime attacked by Adam Smith, whose principle was that "the purpose of production is consumption," not that the purpose of production is to maintain the producers in the style to which they have become accustomed. Particular attention should be paid to Goodman's statement about, "When wages drop below subsistence." Although such a notion is common in political discourse, it is all but senseless. If you pay a neighbood kid to mow your lawn, do you owe him a "subsistence" income? Should any pay for any work warrant a "subsistence" income? This is absurd. The argument seems to be that if doing a job is not worth a "living wage," then it should not exist. If, instead, what it is supposed to mean is that the evil capitalists of infinite wealth can simply raise wages to the "living" level in any job, then this is a fantasy. Most jobs are in small businesses that operate at the margin, and the price fixing of wages, i.e. raising the "minimum wage," not only may put some employees out of work, as a business cuts costs, but it may simply put the whole business out of business (what Clinton's dimissive remark was about -- years later we heard her say that businesses do not create jobs anyway). The empty storefronts and even abandoned buildings of Detroit or Baltimore, or in other locations benefiting from the compassion and "social justice" of the Democratic Party and socialists, are the result. And in fact, there is only one "minimum wage." And it is always the same. Which is zero. So Goodman has fallen for an absurd Leftist, moralistic narrative. Historically, if a job does not pay enough for someone, or their family, to live on, the alternatives are, (1) change jobs, including moving away, (2) get a second job (often called a "moonlighting" job), (3) pool incomes or expenses with others who have jobs (i.e. get a roommate, live with relatives, find Baker Street rooms with Sherlock Holmes, etc. ), (4) increase your human capital through training, internship, apprenticeship, or schooling, which warrants more valuable employment, or (5) start your own business. Indeed, in American history, no ethnic group has ever become generally prosperous without an entrepreneurial tradition. And it is also revealing that successful ethnic minorities, starting and running their own businesses, anywhere in the world, tend to be disliked, disparaged, robbed, and often attacked by riots or political sanctions, up to and including explusion, massacres, and genocide. This is familiar enough in European history with the Jews, but it is a common experience with overseas Chinese, Indians, Armenians, Greeks, Lebanese, Tamils, Igbos, Koreans, etc. in many locations. But Karl Marx knew absolutely nothing about running a business; and far too many modern politicians, and even economists, let alone philosophers, seem to be in the same situation -- as when George McGovern said, after two bankrupt businesses, that he might not have voted for the legislation he did had he known what running a business was like (this did not, however, change his political preferences). Indeed, if truth be told, they despise people with small businesses. Those fools are drudges, working limitless hours. Their hands are literally dirty with actual money, which they expect to receive from the people who buy from their stores. This is ignoble, as we already know from Confucius. I kid you not. One thing we can say for Bernard Mandeville; he did not recoil from activities that are down and dirty. He recommends them. It is just that his recommendations include the political corruption and the crime that both victimize shopkeepers and others of "good-natur'd heedless" industry and prudence. From political manipuations that amount to protection of producers, consumers always suffer, including the "old, the halt, the very young, and the handicapped," who are expected to pay more so that politically connected business, and labor unions, can prosper to the extent they think owing them. It is consumers, of whatever capacity themselves, who are "dispensable" to the political forces that respond to the interests of producers. If a free market provides cheap and abundant commodidies, it is not clear how it fails Goodman's expectations. How is it that "the invisible hand will starve" anyone? People tend to starve when food is not available or is priced out of range. But the "invisible hand" historically means both abundance and low prices, to the point where "Marxists warn" us now about the evils of "consumerism," which evidently means that we have too much, or have things that the bien pensants don't think we need -- but we do need to get out of the way of their limos. But Goodman clearly means that the "invisible hand" is evil because it doesn't give things away free to people who actually don't have any job or money. However, if it is the duty, perhaps legally enforced, of productive people to give away things for free, then they are slaves. So Goodman wants slavery. Or perhaps he is confused. For things are already given away for free, to people who don't have any money, or can't earn it in the ordinary way. This is called "charity," and it is generally recommended by religion and by morally serious people, including people like John D. Rockefeller, who, despite being a rapacious "Robber Baron," ended up giving away more money than anyone had actually ever previously possessed. Lenn Goodman himself teaches at Vanderbilt University, which was founded with the fortune created by Cornelius Vanderbilt. The Left, of course, doesn't want anyone to be giving away their own money. They want the money taken away from its owners so that they can buy votes and dispense patronage, whether or not it actually helps anyone in the categories listed by Goodman. The "War on Poverty" has notoriously left proverty pretty much where it was in 1965, after spending trillions of dollars. This is called "compassion," which apparently is what Goodman thinks the "invisible hand" lacks. Charming as always, Bernard Mandeville recommends that those unable to earn an honest living should simply earn a dishonest one. So perhaps the Welfare State would be fine with him, since it is a tissue of corruption, where the bureaucrats, administrators, and politicians join the Ruling Class, while the ostensible beneficiaries of the poverty "programs" enjoy the crumbs brushed off the Washington banquet table and may live in the squalor and misery of what is called "public housing" -- "council estates" in Theodore Dalrymple's Britain. Two winters in a row (2018-2019), the public housing of the New York City Housing Authority (NYCHA) has left many buildings without hot water or heat, often for weeks at a time, with meaningless excuses for lack of maintenance. But if what we want is the maximum wealth and prosperity for all, capital, entrepreneurship, and the market must be allowed to do their magic, which all depends on what people want, not what elites think they should have. So we can consider each of the three shots taken by "waste or want" Goodman against capitalism. The first one, to condemn Bernard Mandeville, is warranted, except that it cannot accomplish what Goodman thinks it does. Mandeville recommends corruption in all areas of life, and this is no more appropriate for any kind of government than it is for free market economics. The very idea that vice is productive of good, although we might get the same notion from Ayn Rand, is intrinsicly confused and wrong. Private vice is harmful for private life; and public vice, which is harmful to others, is treacherous, tortuous, or criminal. The only dilemmas in this are the proposition that perhaps some people, like Charlie Sheen or Robert Downey Jr., are better off in jail than dead from a drug overdose. However, this may be an example of the principle that hard cases make for bad law, since the sanctions of drug laws fall as harshly on people who may be in no danger of self-destruction, while the lawless regime of illegal drugs means that overdoses, from drugs that are either adulterated or otherwise of unknown strength, are more likely to be fatal. Somehow, America made it through the 18th and 19th centuries, despite the existence of opium, hemp, and cocaine, without the protections of drug laws -- while the regimes of prohibition tend to result in the increased potency of what is prohibited (e.g. whisky instead of beer, heroin instead of opium, crack instead of powder), for ease of transport. Addiction is a medical problem, or a moral problem, but it is not suited to be a legal problem. Goodman's second shot, as "Mr. Conspiracy," against the "invisible hand," is totally confused about what that even is, let alone what it is supposed to accomplish. Charity for those unable to provide for themselves can be done much more effectively with goods that are plentiful and inexpensive, by which charitable funds go that much further. The idea that people are owed an income or other benefits, which must be provided by force, is subject to what is called "moral hazard," which ultimately means that the productive, who generate both the goods and the charity, come to be despised, both as "greedy" for not providing more, and as foolish, for continuing to work producing things that otherwise could be demanded, for free, from others -- as politicians promise "benefits" that they do not themselves create, but must be taken from the productive. This dynamic, the bane of every Utopian experiment in the 19th and 20th centuries, was something actually well understood by Ayn Rand, who was a living witness, as is often forgotten, of the Russian Revolution. The third shot, to smear capitalism as Social Darwinism, is perhaps the most grotesque. In strictly Darwinian terms, those who fail in the struggle of life drive evolution by dying, thereby eliminating the genes for unsuccessful adaptations. This is indeed what we want to see among businesses and the producers of goods -- not so much that they die, but simply that the unsuccessful businesses fail (rather than being sustained by government as "zombie" businesses, which has helped Japan's economy stagnate for a couple decades, and was rapidly affecting American business under the Obama Administration, when we were told by learned economists that there would never be rapid growth again) -- but it would be astonishing if anyone in business devoutly wished for the death of their customers. Unless, perhaps, you are in the funeral business, although even there living customers tend to pay for the services. But it would be a particularly perverse desire for those in the business of providing food to conceive a strategy, as Goodman says, to "starve those whom" Natural Selection has somehow disfavored. And since Goodman says that this will be done to those "whom pity fails to sustain," we must ask what this means. Is Goodman saying that the grocer owes free food to the indigent, even if this would put him out of business? In which case, no one gets food from him? Does Goodman think that all charity is "pity"? And does Goodman believe that there is so little charity, or so little pity, that only free food from every grocer stands in the way of general starvation? In these respects, Goodman's misconceptions, and his attack on the productive members of society, is a mass of confusion and incoherence. Or perhaps not. Goodman's view may be one of disturbing coherence if he sees only "pity" as standing in the way of starvation. The basic motive for charity is compassion and humanity, not pity. The way he uses "pity" may be to delegitimize the whole idea of charity, in favor of precisely the "welfare rights" that require a welfare state and socialism, where everyone has a right to demand income, health care, housing, food, clothing, and entertainment (i.e. all necessities and diversions -- panem et circenses) from government, perhaps with no strings attached, i.e. that prudence or conscientious application for employment are unnecessary. This is the recognizable political program for people with no more than a "Cargo Cult" level of economic understanding, or who think that everyone has a natural right to everything, no questions asked -- that would be "judgmental." Of course, no government can run, for long, on such principles, which is why states that are praised as exemplifying such a program, like Cuba, are actually hell holes of poverty and tyranny. Exactly what Goodman expects is unclear, but his use of the term "pity" is a bad sign [note]. Finally, we should wonder why F.A. Hayek speaks favorably of Bernard Mandeville. In this, I can only think that he is has not read or understood the man carefully. Hayek is not one to recommend the benefits of crime. Quite the contrary. Nor is he one to urge self-destructive vices on all citizens. So what must have happened is that he has mistaken Mandeville's idea of "vices" for innocent self-interest, and he has mistaken "Publick Benefits" for the operations of the free market, protected by real laws and the operation of disinterested justice, all protecting person, property, and contract. Properly understood, the very word "vices" in Mandeville's subtitle should betray the problem and set off the alarm [note]. The sound moralist will appreciate that "vice" implies harm, either private or public, hence the strength of the derived adjective "vicious," which never implies anything good and tends to be applied to criminal and brutal acts and criminal personalities. Indeed, "vice" as such tends to mean personal vices and private harm, while "vicious" is almost always used for acts that harm others -- a curious case of the semantic difference between private and public being mirrored in the difference beween noun and adjective. We have a similar caution in Greek, where "vice," , can as easily be translated "evil," and has a stronger sense than its origin in , "bad, evil" -- plural , "evils" -- with the added confusion that English uses the noun "evils" for the plural of the adjective "bad." As Plato has Socrates say to Glaucon, there "will be no end to evils," , until these mistakes and confusions involving Bernard Mandeville, a false friend of freedom, are corrected, and the calumnies based on his ideas, which are allied with attacks on freedom and on the industrious and prudent, are discredited. An evaluation of Mandeville similar to what I have given here can be found in Self-Interest and Social Order in Classical Liberalism, by George H. Smith [Cato Institute, 2017]. In this collection of essays, we have ones entitled "Bernard Mandeville," "Mandeville on the Benefits of Vice," and "Bernard Mandeville vs. Francis Hutcheson." Smith usefully provides critical remarks about Mandeville from Hutcheson, Hume, and Adam Smith. He also questions the acuity of Hayek's treatment of Mandeville, pointing out that Hayek overlooks Mandeville's affinity with Thomas Hobbes, where both of them deny the principle of Hume, Edmund Burke, and Hayek himself that the best principles of law and justice arise unintentionally from custom, habit, and history (the "spontaneous order"), not from intentional legislation. We do not get a discussion from Smith, at least not in these essays, about the damage that has done by Mandeville to capitalism in public discourse ("Greed is good") and scholarship such as I have examined with Lenn Goodman. George H. Smith (b.1949) is a essayist, columnist, and independent scholar, apparently without any academic credentials or affiliations apart from the Cato Institute and other libertarian venues (such as the Institute for Humane Studies, IHS). Nevertheless, he is published by Cambridge University Press -- The System of Liberty: Themes in the History of Classical Liberalism . He has also published defenses of atheism, e.g. Atheism: The Case Against God. The sensible and informed treatment we find from Smith about Bernard Mandeville thus may not extend to all matters [not]. Marxism, of course, is not a warning. It is a prediction. If the capitalists heed the "warning" and reform their ways, this will not be good enough. Capitalists and the whole capitalist system must and will disappear. Goodman says, "Marxists warn of alienation under Mandevillian economics." However, in Marxism alienation is intrinsic to all of capitalist production and wage labor. If Goodman is urging on us some kind of non-Mandevillian but still capitalist economics, it will still be alienating to any real Marxist. To be without alienation, the economic system must be, not just non-Mandevillian, but non-capitalist. We therefore can only ask Goodman what he means. The drift of his analysis is that Mandeville, Adam Smith, and Social Darwinism are all of a piece, which means his condemnation would be a truly Marxist rejection of all capitalism. But he doesn't come right out and say so. The Marxist idea of alienation, of course, is that the capitalist, through the fiction of capital and profit, and the evil of wage labor, steals part of the value with which the action of the worker endows the product of his labor. Indeed, he steals so much of it that the worker is eventually pauperized and does not have enough to sustain life. So the capitalist lets him die and brings in someone, perhaps a Lithuanian immigrant, to take his place, for a while. A little reflection, however, and we discover that Marx violates his own principle. If under Communism, the rule is that "from each according to his ability, to each according to his need," then the worker has no right to any of the value that is intrinsic to the product of his labor. He only has a right to what he "needs," while at the same time he owes all of his ability to the collective. A person of substantial ability but few needs would therefore enjoy little of the fruit of his labor -- he doesn't "need" it -- and, by Marx's own prior definition, he will be in a state of permanent alienation. The result of this in an orthodox Marxist regime will therefore be a system of theft, one in which those doing the thieving will also provide for themselves, with the result that, thinking well of their status and goodness, they will take for their lifestyle that they think they deserve. In other words, dachas, luxuries, and privileges. There has not been a Marxist regime in which it is not the case that, in George Orwell's words, "some are more equal than others." Stalin also realized that he needed to put his foot down on this "need" business. Thus, the Stalinist Soviet Constitution says, "from each according to his ability, to each according to his toil." You are going to have to work for what you "need." And while Stalinists would say that this only holds under "socialism" and not under "communism," we are otherwise free to recognize it as the "free rider" problem that plagues any system where some can claim benefits for free and as entitlements for which no compensation is required. As it happened, Soviet Russia could not even provide the goods to which people were entitled for their "toil." So either Goodman is a Marxist without telling us, or he is confused about the very meaning of "alienation" in Marxism. The real and honest Marxist "warning" would be that they will kill us. The Broken Window Fallacy begins, like the Prisoner's Dilemma, with a concrete example. A vandal breaks a storefront window. The merchant must spend money to have the window replaced. This means business for the glazier, and for his supply chain. This is good, right? Economic activity, right? But in this we must apply another economic principle: What is seen, and what is unseen. The glazier we see. His business and activity we see. What we don't see is the alternative use for the money that the merchant had to spend. In the first place, there is no economic benefit, only loss, to the merchant. He is out the money of repair, and the only benefit is to restore his window to the state it was before. Net loss. And everyone who needs to spend money for repairs knows it. If the merchant had been able to keep the money, and had done no more than spend it on a nice dinner, he would have been in better shape. A nice dinner is a good, and it also generates economic activity for the restaurant and its employees. So who deserves the activity more, the glazier or the restaurant? All in all, it doesn't make much difference. The difference is that the merchant enjoys the dinner but doesn't enjoy replacing a broken window. And there may be other losses. Customers may find a boarded up window, until the glazier arrives, disturbing. They may think it means that the neighborhood is bad. The merchant consquently may lose business, perhaps permanently, especially if the neighborhood is bad and the vandalism is repeated. None of this is good. But what if the merchant had planned on using his money to expand his business or hire more employees? He has lost his ability to do that, which would have benefited all his customers, and his new employees. Or what if he had simply left the money in the bank? The bank might have done with it what banks do, which is to loan it out, from which it derives a profit (benefiting stockholders) and from which some other part of the economy may benefit, as the loan is either spent, as on a new house, or invested, to create or expand a business. In those terms, the broken window itself represents a loss of value that does not figure in any of the other scenarios. Even the glazier would have been engaged in more produtive activity by installing windows in a new building, or upgrading or replacing windows that have gotten too old or unfashionable. In each case, there is an increase in value from the starting point, not a restoration of value just to return to the starting point, as with the broken window. The general principle, of which we should be sensible, and is the moral of the story, is that undesired destruction is never good. It is well to keep this in mind when the Broken Window Fallacy is applied to World War II, as it often is. This got people employed and, we are told, really got the economy going. But this is all misconceived. Getting killed, wounded, or mutilated in combat is not a good job. Getting paid when there are no consumer goods to buy, including housing, automobiles, and even tires, does not result in economic benefit. What the government wanted people to do with their money was loan it to the government (buy war bonds) to pay for the War. Eventually there was a benefit from that, as the war bonds were paid off in the 1950's; and the high taxes of the 50's, which have been the Golden Fleece of tax advocates ever since, were responsibly used to pay the bonds, which returned the money directly to the private economy -- unlike taxes now, which are generally wasted on corrupt political spending. At the time, consequently, World War II was really no benefit to the economy, or to the quality of life of Americans. What did benefit them, after the War, was that inflation and wartime wage and price freezes had driven wages down to a market clearing level, which ended the high unemployment of the Depression; and also the anti-business rhetoric and assaults of the Roosevelt Adminstration ended. Both capital and labor were freed up, taxes went back to the private economy, and we see a prosperity in the 1950's such as had been missing since the 20's. This was actually a surprise, albeit it a pleasant one, to most. There had been predictions that the Depression would return after the War, since many politicians and even economists couldn't imagine that economic conditions were all that different in 1946 than they had been in 1938. But unemployment in 1938 had been 19%, while in 1946 it turned out to be 4%. How did that happen? War industries had closed down, and the military had returned its millions of men to civilian life. Where did those jobs come from, jobs for which everyone had been begging in 1938? Of course, those jobs were created by capital, and hiring was possible at market-clearing wages. The modern Progressive, of course, hates capital, which Marxism says is a fiction, and loves artificially drivng up wages, which was the policy of the Hoover and Roosevelt Administrations. Even today, influential people choke on admitting that the Hoover and Roosevelt Administrations applied the same failing and unsuccessful policies. Their program is still the Progressive recommendation. 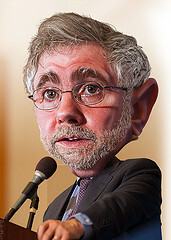 Which brings us to Paul Krugman [ ]. Progressives have also choked on admitting that the "stimulus" and other policies of the Obama Administration were not very successful, with slow growth and people leaving the work force, making for the worse economic recovery from a recession since World War II. Krugman did admit this, but his response was to hope for an invasion by extra-terrestrials that would stimulate the economy the way it was during World War II. The reaction to this was, naturally, widespread astonishment and derision. With Aliens presumably destroying American cities, even Krugman realized that this was the Broken Window Fallacy writ large. But he actually tried arguing that this would be a good and beneficial Broken Window scenario. Now this is not as silly as extra-terrestrials, and it doesn't involve the widespread destruction of war, or the Broken Window Fallacy; but it does show us the inner workings of the Keynesian mind. Consumer spending cannot replace "business investment." Economic growth requires capital, and Keynesians are nearly of one mind with Marxists that capital is a fiction. Consumer spending is supposed to create revenue for businesses, and greater profits, which, of course, politicians want to tax away, because it doesn't occur to them that greater profits for capital investment is supposedly what they had been wishing for. But we can't let those capitalists actually profit from prosperity. Of course, that is not what catches our attention here. Krugman wanted a "housing bubble." And he got it. When the bubble later burst in 2008, nearly taking down the economy, Krugman had to retreat to a Bart Simpson, "I didn't do it," defense. Of course, he wanted to blame banks and Wall Street, rather than the coercion of his friends in the Federal Government in creating the bubble. But the real issue was wanting a "bubble" in the first place. There will always be a business cycle, but a credit collapse doesn't need to be as bad as it will be when credit has been artificially and imprudently inflated by political power. And the use of political power was exactly what Krugman was calling for. That is how Keynesians think. We also see further foolish statements by Paul Krugman, for instance on the success of the Veterans Administration medical system, or the economy of the European Union, at the page on Say's Law. The Broken Window Fallacy and the principle of the seen and the unseen were both introduced by Frédéric Bastiat (1801-1850) in his essay Ce qu'on voit et ce qu'on ne voit pas, i.e. "That which is Seen and That Which is Not Seen" . They were nicely restated by Henry Hazlitt (1894-1993) in his classic book, Economics in One Lesson . One cares for one's children or other family members out of love, not out of just compassion and humanity, let alone pity. Similarly, welfare concerns used to be addressed, not by government, but by "mutual aid" societies. De Tocqueville had thought this was the kind of thing that distinguished American democracy, American society, and American culture from pretty much all others. However, this tradition is now almost gone, replaced by the welfare state, as bad coin preplaces good. Mutual aid societies were based on a variety of things that might bring people together to help each other. A big one was religion. Anyone's religious affiliation was already a community and an organization dedicated to mutual aid. One way in which this has been conspicuous is in the religious affiliation of hospitals. Where I long lived in the San Fernando Valley, St. Joseph's (Catholic) Hospital in Burbank and Valley Presbyterian in Van Nuys were conspicuously religious. South across the Santa Monica Mountains, two venerable Los Angeles hospitals were Cedars of Lebanon and Mt. Sinai, both Jewish, which later combined and built a new, common home. Religion, however, was only the beginning. Mutual aid societies could be based on profession, ethnicity, fraternal societies, and those that were simply a commercial enterprise. Since mutual aid societies featured insurance services, surviving insurance companies like Travelers, Farmers, Fireman's Fund, and State Farm still bear their origins in their names. And professional societies overlapped employee's unions, which could provided many of the same kinds of services. Ethnic organizations were formerly lifelines for the settling and assimilation of immigrants -- and for the preservation of traditional identity despite assimilation. Thus, my first textbook for the Armenian language was published by the Armenian General Benevolent Union (AGBU), which seems to have been written for Armenian-Americans whose first language is English and who may know no Armenian at all. Thomas Sowell mentions that the first ethnic group in America for which there wasn't a "benevolent" organization was Puerto Ricans, who only moved in large numbers to the Mainland after the development of public welfare, which precluded mutual aid formation. Meanwhile, walking through Chinatown in San Francisco, one might notice doors to things like "The Lee [ ] Family Association." Thus, Chinese mutual aid societies can be particularized down to the level of a single surname -- although there are millions of Chinese Lees (not to mention Korean and Vietnamese ones). A fascinating service of some ethnic benevolent associations were revolving credit arrangements. Thus, new immigrants might be given a loan to start a business. Once the business was established, the loan was paid back. In principle, this required only enough capital to start a business once, and then, relying on the prudence of the borrowers, the money would be passed on to the next borrower. Of course, with more capital, many immigrants could be halped at once, and the occasional defaulter would not sink the system. Such revolving credit, of course, would only work with ethnic groups who already had an entrepreneurial tradition and whose borrowers generally could be relied upon to create successful businesses. Perhaps among the most intriguing of mutual aid societies now are the fraternal societies. These probably began with the Masons, after whom others were patterned. Many of them now seem silly, like the Oddfellows and Rebeccas, or the Fraternal Order of Eagles; and often little of them remains but a few curious rituals performed at the "lodge" and a bit of attendant socializing. But hints also survive of more serious concerns. Thus, the Shriners, conspicuous in silly hats (fezzes), have serioiusly dedicated themselves to childrens hospitals. This now seems unusual, but a century ago such things were ubiquitous. So we may begin to get the drift of what was done. You pay your dues, and what you get includes various kinds of insurance -- health, unemployment, disability, burial, etc. Health insurance didn't always mean that you went to a doctor and the society paid for it. 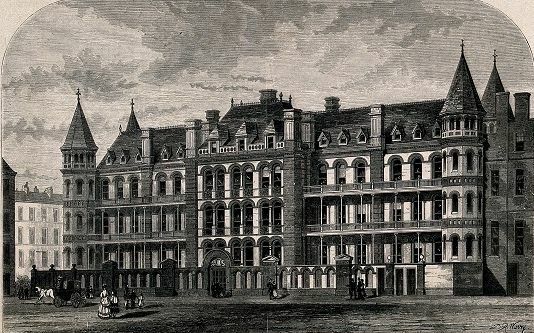 Originally, a society might hire its own doctor, pay him a salary, and then he looked after the primary care of the all the members of a lodge. He was, consequently, a "lodge doctor." This practice was later fiercely suppressed by the American Medical Association, which detested the status of doctors as employees and wished to drive up what they were paid. The success of that approach is now breaking down, as the government deliberately wants to make doctors employees of organizations that can ultimately be absorbed into a government run medical system, like the Veterans Administration in the United States, or the British National Health Service -- i.e. socialism. Beyond the individual lodge, the society could provide services on a local or national scale, with hospitals, orphanages, retirement homes, perhaps even schools. Thus, whether or not the financial benefits of the society included pensions, the provison of "old folks homes" could constitute the equivalent. A difficulty of mutual aid societies was that they needed, as insurance, to be actuarially sound. This was sometimes a problem, and they could get into financial trouble. Of course, when the idea developed that what they did could be better handled by the government, the infinite resources of the taxpayer, and of public credit, could long conceal irresponsibility and corruption on a massive scale. Thus, Social Security and other enormous programs are constructed as no better than Ponzi Schemes, such as that run by Bernie Madoff. The day of reckoning for these may be comfortably far off for politicians, but not in terms of the future of the Nation. The Federal Reserve System keeps interest rates low in part to prevent interest on the National Debt from overwhelming the finances of the Federal Government. Low interest rates, however, reduce the incentives to lend, which slows economic growth, such as we have seen since 2009. Thus, statism, on the way to destroying itself, has already all but destroyed American traditions of mutual aid. In long run, which John Maynard Keynes is supposed to have dismissed with the observation that "we'll all be dead," the inability of the government to keep its promises -- as we already see in Greece and elsewhere -- will mean that mutual aid will be necessary again. Hopefully, its values and habits will not have been completely forgotten. Meanwhile, if, like Goodman, we dismiss love, compassion, and humanity as all representing no more than "pity," this will hurry the day when the impersonality, corruption, and irresponsibility of government will precipitate its own collapse. This may be good. Mandeville, indeed, is an incubus from which not even Hayek has quite freed himself, in terms that we can see in this passage. Key problems are evident in the lines I have put in boldface. Mandeville does in fact regard as vicious everything done for "selfish purposes." But it is worse than that. Mandeville entirely ignores purposes that reflect no more than innocent and prudent self-interest. It isn't just that what is "selfish" is vicious. All self-interest (what the age often called "self-love," and Mandeville himself often "Pride") is vicious. But it is even worse than that. We cannot correct Mandeville's error by replacing "vicious" with "innocent self-interest," for the examples that he gives of vice, particularly theft, fraud, and general dishonesty, really are vicious and cannot be eastily defined or substituted away. The argument, indeed, is not just that self-interest generates public benefits, but that real vice, dishonesty, and crime generate public benefits. So it isn't just, as Hayek says, a "rigoristic standard," which we may discount as a confusion or overreach. It is, at the same time, a blindness to innocent self-interest together with endorsements of positive and properly regarded vice and crime. This is a muddle that would be bound to perpetuate an "incubus" in the minds of both friends (Hayek) and enemies (Goodman) of the free market. From Hayek's entire essay, it is not clear to me that Hayek himself ever clearly distinguishes between (1) innocent self-interest, (2) "selfish purposes," and (3) positive vice or crime. They are never properly differentiated; and Hayek, by here actually quoting St. Thomas, reinforces the idea that vices and "sins" -- peccata -- actually can be beneficial, which affirms Mandeville's full thesis -- although I doubt that St. Thomas wanted to say that all sins have useful effects. So it is not just that Mandeville has "saddled himself" with an incubus. Hayek has stumbled into the same predicament also. The matter is further confused with the statement that Mandeville admits "as virtuous only what was done in order to obey moral commands." But Hayek surely knows his Aristotle better than to think that virtues are only the result of "moral commands," which is a view of ethics almost unique to Modern Philosophy, beginning particularly with Kant. The Aristotelian agent who seeks the mean, the measure, , of courage between cowardice and rashness, is not thinking in terms of "moral commands," unless we draw out the argument with the principle of St. Thomas that "the good is what is to be done," which loads the virtue of courage with a moral obligation. Yet the Aristotelian agent certainly wishes to display the right measure of courage as a matter of prudence, so as to effect his self-interest (in winning at combat, perhaps), not as some kind of duty. The principle of St. Thomas actually turns prudent self-interest into obligatory righteous virtue (an error Charles Murray makes), quite the opposite of the idea that all self-interest is vicious. So this is a mess with deep roots, and Hayek makes no real headway in sorting it out. "Selfishness" is, of course systematically confused with self-interest by Ayn Rand; but if we seek a bright line between prudent self-interest and "selfishess," the matter becomes almost impossibly vague, since, as in the definitions of avarice examined elsewhere, is comes down to a matter of what is "excessive." This reduces to something so subjective as to usually be useless, unless it illuminates the underlying view of some that there should be no private property or possessions, and that if I "need" what you have, I have more right to it than you. This is often what we see on the playground where terms like what is "selfish" may first be encountered. If I have something you want (my lunch, my money, my shoes), you (perhaps a bully) may argue that I have a duty to "share," and if I don't, I am "selfish" (and deserve a beating) -- today this is often the nature of the relationship between a citizen and the government. That is one reason I found the Greek term more interesting than avaritia, since its definition involves "one who has or claims more than his due," or "a larger share of a thing." The issue of what is "due," or what one's "share" ought to be, will raise questions of ownership, where I am always tempted to quote Matthew 20:15, where God, in effect, asks, "Or am I not allowed to do what I wish with mine own?" (see above). Accusing people of being "selfish" often involves denying that they are "allowed" to do what they wish with their own. If philosophers cannot distinguish between prudent self-interest and purposes that are "selfish," there is little hope of clarity in anything. But Hayek has made things worse for himself, first by allowing with St. Thomas that "sins" can be beneficial, and second by not recognizing that Mandeville's vices are not just matters of "selfish purposes," but positive evils, including self-destructive habits and criminal acts against others. These are not just incidental problems with which Mandeville has perhaps gratuitously and carelessly "saddled" himself. They are essential and fundamental to his original presentation and argument, with unfortunate implications that Hayek himself has incautiously failed to differntiate, identify, and reject. The beginning of Hayek's paragraph above may tell us more about his problem. Saying that Mandeville's "main general thesis emerges only gradually and indirectly" means that the things Hayek likes only pop up in the course of Mandeville's later "Remarks" as a "byproduct of defending his initial paradox." What Hayek's calls Mandeville's "initial paradox," however, is actually the whole argument of the original Fable of the Bees, with whose terms Hayek is careless and dangerously uninterested. Instead, the "main general thesis" only assumes that character in terms of Hayek's own hindsight and developmental teleology, where Hayek's interest is caught by occasional statements that sound like precursors to the ideas of "spontaneous order" that turn up more fully developed in Adam Smith and Hume -- on the one hand in relation to the "invisible hand" free market but also in relation to the idea of the evolution of culture and institutions, as described by Hume and Edmund Burke, which does not involve human intention or design. Mandeville obviously does not develop these ideas in any intentional or even coherent way, and sometimes the best that Hayek can do is suggest that Hume or Smith got thinking about the matter from reading what are no more than hints in Mandeville. Thus, Hayek must answer his own question -- "how far did Mandeville himself... quite see what Mandeville was driving at?" -- with a negative, that Mandeville himself did not see what, in Hayek's judgment and hindsight, he was "driving at." This would be an odd thing to say about anyone. Hayek therefore does not give us a proper treatment of Mandeville, whose actual "main general thesis," about real vices, continues to cause confusion and damage, in ways that Hayek has failed to remedy, that Rand exaccerbated, and whose vicious terms and confusions are on full display in the statements by Lenn Goodman. And it is not just words. As I write in 2017, "anti-capitalist" rioters are disrupting an economic summit in Hamburg, Germany, almost thirty years after the Fall of Communism. Yet a generation of young fools (and old fools like Bernie Sanders) in the West want it back, with their violent actions at American colleges signifying their truly totalitarian values and ambitions. If we realize that it is what they have been taught, by the "tenured radicals," the grave dimensions of the problem emerge. In the 2016 Preface to George H. Smith's Atheism: The Case Against God [Nash Publishing, 1974, 1979, Prometheus Books, 2016], Lawrence M. Krauss (whose carelessness with the history of astronomy has previously been noted) praises Smith for his attack on agnosticism, i.e. that agnosticism is an alternative to theism and atheism. But when we look at Smith's treatment in the text, it is hard not to say that it is an example of sophistry, or at least a case of ignoring ordinary usage and common sense. It all comes down to his definition of "atheism," which is that "Atheism, in its basic form, is not a belief: it is the absence of belief" [p.7]. This is to construe it as no more than the logical contradictory of "theism," which is "belief in a god or gods" [ibid.]. There is a logical tidiness and simplicity to this, but does it match or conform to common usage? Smith realizes that according to his definitions, a babe in arms is an "atheist," because it certainly lacks a belief in "a god or gods." But I dare say that only someone who wishes to distort usage for the sake of his own argument would consider a pre-linguistic child to be an "atheist." There is something wrong there. Edwards is more in line with usage and common sense, and his definitions eliminate the anomalous case of considering a babe in arms to be an "atheist." Smith's definitions eliminate any logical room for agnosticisim, which is a suspension of judgment about the existence or non-existence of God or gods [pp.8-13]. The reasonableness of this depends on the reasonableness of Smith's approach as a general principle. We should be immediately suspicious when we recollect the venerable principle of the Skepticism of Pyrrho of Elis to "suspend judgment in all things" -- the , epoché, "suspension." A limited version of this was adopted by Edmund Husserl (1859-1938), whose "phenomenological" method was to suspend judgment on the question of the existence of external objects. Now, affirming the existence of external objects is a form of ontological "realism." Denying it is "anti-realism." If we construe this in parallel form to Smith's treatment of atheism, then Husserl's suspension of judgment -- agnosticism -- about realism means that he is an anti-realist. That this is not what Husserl meant, and it misconstrues the structure of his phenomenological method, should give us pause about the reasonableness or naturalness of George Smith's definitions of theism and atheism. "Anti-realism" is not just the logical contradictory of realism, it is the denial what realism affirms, i.e. the existence of external objects. Similarly, in ordinary language, atheism is not just the logical contradictory of theism, it is the denial, as Paul Edwards said, of what theism affirms, namely the existence of God or gods. The sophistry of Smith's definitions begins with shifting theism and atheism from being ontological affirmations or denials of existence, which I would call "direct" theism or atheism, to being psychological affirmations or denials of belief, which are only indirect statements about the metaphysics, which is why then I would call the statements of belief the "indirect" versions of theism and atheism. So it is not a matter of the existence or non-existence of God or gods, but a matter of the existence or non-existence of belief in God or gods. Edwards makes some provision for this, but without allowing for the counter-intuitive results of Smith. I suspect that Smith construes his definitions as a way of claiming that many more people are atheists than we generally realize, since babes in arms or persons with no opinion in the matter are natural atheists. And perhaps this goes with the desire to assert that atheism is the natural state of the human mind. But this is really dishonest. People with no opinion in the matter, who may even be sophisticated enough to invoke Pyrrho of Elis, will not accept George Smith telling them that they are really atheists. And if he says, "If you have no belief in a god or gods, then you are an atheist," the proper response would be, "Then you are a sophist." The table at right is a square of opposition with all the permutations of affirmatives and negatives on "believe" and "exist." So these are all indirect statements. Contradictories are on the diagonals. This exposes another ambiguity in Smith's treatment. Ordinarily we would say that the proposition "I do not believe there is a God" implies "I believe there is not a God." Smith, however, avoids allowing for this inference. His interpretation of "I do not believe there is a God" is that "do not believe" means an absence of belief, which means that the subject has no belief either in the existence or non-existence of God. Thus, we do not have the case of a subject having a belief, which then happens to be a denying belief. So the proposition "I do not believe there is a God" does not imply "I believe there is not a God." This means that the babe in arms and the Pyrrhonian Skeptic are, in the absence of either an affirming or denying belief, atheists. Smith's failure to address the logic and ambiguities here should feed a suspicion that he is actually evading clarity, for purposes that benefit from confusion and obscurity. Thus, if George Smith launches his defense of atheism with this kind of thing, and Lawrence Krauss cites it in warm recommendation of Smith's book to the disinterested reader, both of them have properly accomplished the opposite of what they intended. It is a very bad start, and it does not recommend Smith's level of reasoning to us. Given the value of Self-Interest and Social Order in Classical Liberalism, Smith's mind may have improved since his militant atheism in 1974, or perhaps his rationality is less biased and disorted in some matters than in others. We know how the minds of atheists can be overtaken by personal demons, something we often see in lapsed Catholics, like Robert Hughes.